Set of 300 small wooden blocks for younger students. Triangles, circles, squares, narrow and wide rectangles. Workbook lessons teach basic math, shape recognition, 2D and 3D design, and students will create letters and numbers with their blocks. 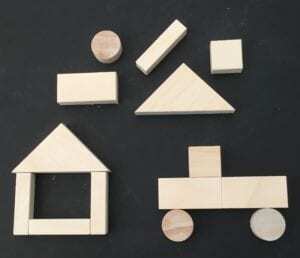 Set of blocks and Workbook $75.00 plus GST and shipping * The MAKER BLOCK set contains small parts and must be used with supervision. The Maker Block set is shipped in one box weighing 7 pounds.